Guns N' Roses' Chinese Democracy is the talk of the music world, and the chatter will only become louder in the remaining weeks leading up to its release on 23 November. Strangely, one person who isn't paying the album much mind is Duff McKagan. The former bassist for Guns N' Roses and current member of Velvet Revolver recently spoke to MusicRadar, during which he admitted that he hadn't heard the record, and probably won't until it comes out. "I've heard the song from Rock Band," said McKagan. "I don't know what it's called, but I heard it once and that's it." Still, the bassist, who revealed he hasn't spoken to Axl Rose in years, said he was happy that his onetime bandmate is finally letting the album see the light of day. "Axl's a perfectionist. Axl's a different breed." "People started asking me about Chinese Democracy back in '98, '99 - that's how long it's been. So if it's coming out, I'm glad for Axl. The pressure's off of him and he can finally let the music go." 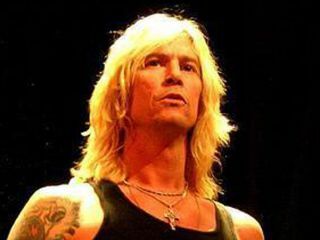 Regarding Rose's notorious, and some would say compulsive, work habits, McKagan said, "He's a perfectionist. There's guys like that who can't let anybody hear a single note unless it's absolutely perfect. Some musicians will play everybody in the band their demos with all the mistakes and they don't care - they know people have to vision to see past all that. Axl's a different breed." However, McKagan was quick to point out that his attention is firmly directed towards his own bands, Loaded (for which he sings lead) and Velvet Revolver, and that Guns N' Roses is very much a thing of the past. "Musically, I don't have any thoughts on Chinese Democracy," he said. "It's not my band. It would be like me having thoughts on the new Tool record."